Pioneer AVIC-8100NEX for Android Auto: A Worthy CarPlay? Nowadays car GPS is a common trend for car owners. The Pioneer AVIC-8100NEX for Android Auto has come up with its own GPS app which is a multimedia receiver launched by Apple. Let's check out what it has to offer. Today when we are outdoors on a drive, and especially our destination isn't a familiar one, we don't have to depend upon the mercy of people guiding us our way. Moreover the lengthy stretch of lonely highways don't really give you a friendly chance to ask around and neither does it guides you every while with bold navigating boards. So technology once more solved the issue and now car GPS is a common trend for car owners. To make it better than before Pioneer AVIC-8100NEX for Android Auto has stacked the stores which is a multimedia receiver from Apple. Let's check out what it has to offer. 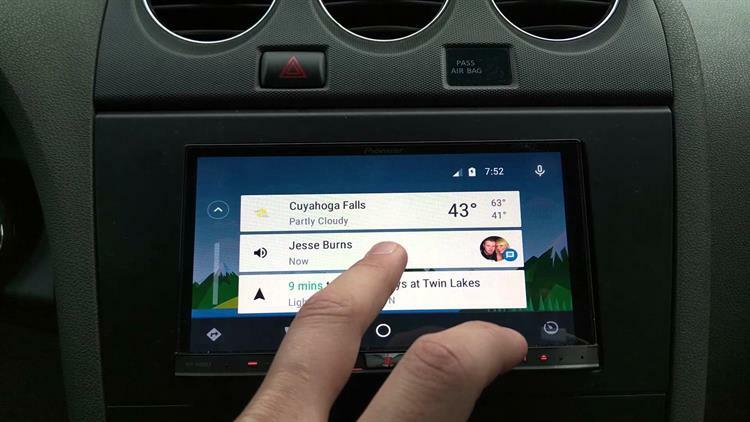 Generally most of the Android Auto-compatible units come with a 7-inch touchscreen and you get to see a line of control switches in the bottom. The 8100NEX model of Pioneer has got a 800x480 resolution capacitive screen which if not deliver a stunning image quality, its quite clear for the purpose it is being used for. Even with direct sun exposure, the screen and its stuff is easily readable, and that's really worth it. 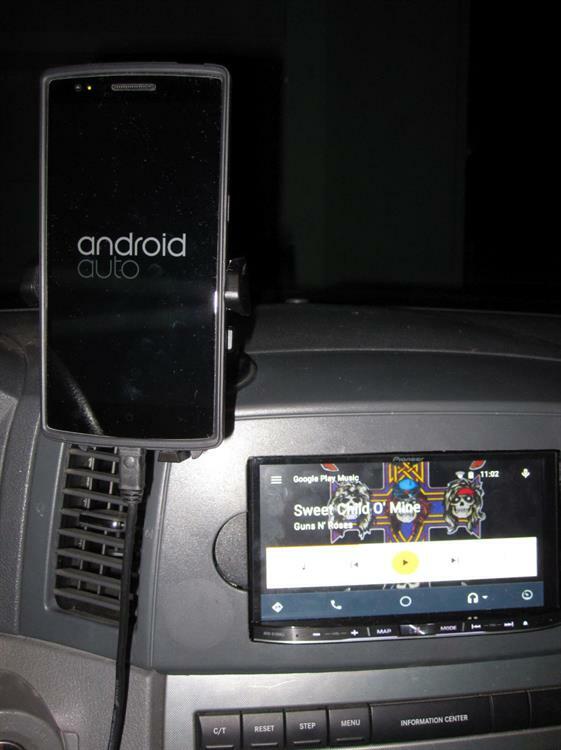 Tested on a fair number of devices like the Moto X, Galaxy S6, Nexus 6, HTC One M9, 2014 Note 4, and LG G3, the Android Auto came out with equally good results. Though Android Auto isn't right now working for OK Google one have only the choice of starting up a voice action by tapping on the screen else if they have a button compatible with the steering wheel. But it needs to be pointed that Android Auto works only if you have plugged a USB cable with the phone. Establishing the connection between the device with your phone would be unexpectedly easy. The moment you plug a phone into the proper USB port, the Android Auto is designed to boot up instantly. 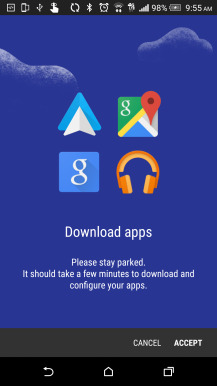 Once you get the Android Auto running on the car's screen, you get the Android Auto splash screen, that is in fact a part of the Play Services. There are some feedback that the in-car interface is somewhat pressurizing the system, so it is advisable to leave the phone and preferably use the car's display. 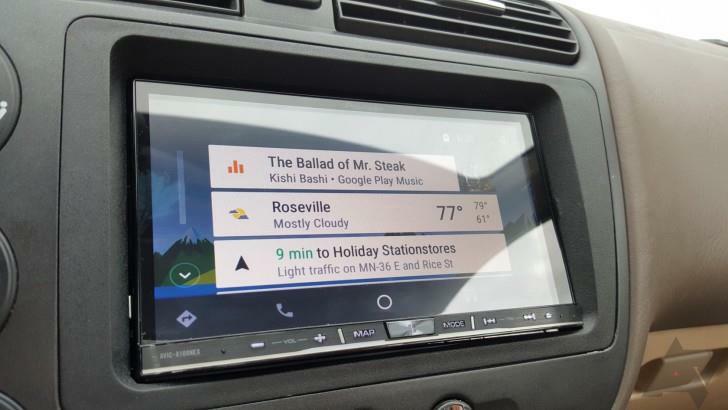 The interface of the Android Auto has five different sections which can be accessed through the buttons lined up at the bottom of the UI. On the extreme there is the Navigation button, then comes the phone, the overview screen, and the audio sequentially. Now on the extreme right there is a screen that contains the car built in data and features listed in it. You can directly go to the navigation screen at any point of time to get the live updated map of your current and exact location, which will be indicated by a small arrow right in the middle of the screen. While moving you can use the voice commands to get the directions. You might get a little bit puzzled when you don't find any particular place to look for messages and access them in the Android Auto. On the contrary, they send you a notification when any message comes, but the flaw here is that it works only for apps which have the proper support. At present all the apps like WhatsApp, SMS, Hangouts, Telegram, and a few more would be working fine. The arriving messages and the notifications will pop up in your screen. The only thing you have to do is to tap the card or the notification in the Android Auto and read the message. You can send a message entirely through the voice command. If you want to reply to a message you have just received, tell the device, "Reply," and make it clear to the app that it now have to send a message back to the sender. Or else, you can ask Google and let them know the type of message you want to send like, a WhatsApp, Hangouts, Telegram, and then choose the contact number. The app has a specified screen for the Calls in the UI right placed just next to the Maps tab. You will also get a number pad to dial the numbers. But there isn't any way to get access to the full contact list, which is definitely an irritant. To ensure the safety aspect, anything that is external to your favorites has to be accessed via the voice command. The Incoming calls would also come as notifications irrespective of whichever screen you're currently active on. To answer a call, it works just like the standard Bluetooth system. Though the voice quality might vary depending on the Android Auto hardware and also where the mic is placed the Pioneer gives you a small adjustable mic that sits just next to the rear-view mirror. The Pioneer AVIC-8100NEX has all the features like Apple CarPlay, Android Auto, MirrorLink, and Pioneer's AppMode which makes the story of integration complete. The Onboard navigation is a constant support to the drivers and won't leave them stranded even if they have forgot to carry their phone along. The 8100NEX MSRP is unprecedentedly high and expensive as we get other devices from other brands in cheaper rates with almost the same features. The AVIC-8100NEX model from Pioneer even with an eyebrow raising price tag comes in handy and does its job well with the fully featured receivers which is a rare combination found in the market. So when you look for a car GPS and its functionality, the worth would automatically be understood, once you compare it with its rivals. But one has to stick to what exactly he needs while making the final choice apart from the price tag that is no doubt a deciding factor.